Over the last month or two many SME’s will have spent a great deal of time planning for the coming year, setting goals and creating a marketing strategy. This is the ideal opportunity to maximise the impact of your online presence, gain more traction and convert website traffic into new business. 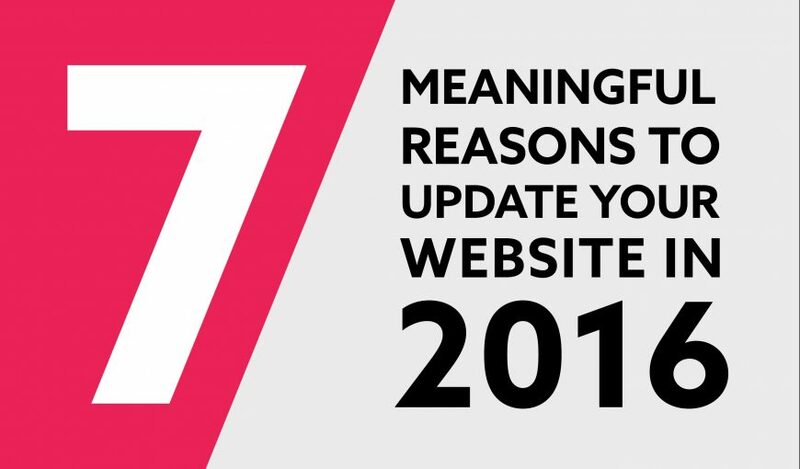 With this in mind, we have created the top 7 meaningful reasons to update your website. It’s no secret that mobile media consumption is now greater than desktop media. In fact, depending on your audience, mobile consumption of digital data may completely eclipse any desktop activity. As an example, when analysing the usage data for one of our B2C clients recently, 82% of all website sessions were on a mobile device. This was not a surprising statistic given their audience (brides to be), but it highlighted how important a dedicated mobile strategy was for them. Creating a mobile strategy isn’t just about optimising your website for mobile browsing. It’s deeper than that, it’s analysing how your customers are using your website and developing an intuitive mobile experience that helps them to buy. Further to that it’s also creating a clear conversion strategy dedicated to mobile users that drives them to do what you want them to. The speed that your website loads could mean the difference between getting an enquiry/sale, and not. In fact, a 1 second delay in page response can result in a 7% reduction in conversions. There are an abundance of quirky web tools and fashionable styles that are available to developers but it’s important to remember that visitors value speed over style. The key to creating a killer website is to ensure that performance underpins every element of the page. If an element is slowing a page down, redesign it or lose it. We see too many SME’s buying into aesthetics without considering the impact on the overall experience and buying decisions of their customers. Aesthetics are important but not to the detriment of speed. Load speed is considered a ranking factor by Google. Therefore if your website is slow to load you are not only limiting your customers experience and sales potential but also the potential for your website to rank well. So what is the optimal website load speed? Anything over 3 seconds is an unacceptable load time on a decent broadband/4G connection. You should be aiming for your website to load in under 3 seconds. Lightbox use tools throughout the development process that help measure load speed throughout the project allowing us to achieve fast load times. Lightbox’s work flow ensures that we achieve optimum load times even on large, graphic heavy layouts as shown below. It’s proven that video marketing improves website conversions. Below are some quick facts about video that illustrate how utilising video can improve conversion rates and visitor engagement on your website. As discussed in the previous point, these stats are only true when video exists on websites that are fast to load. 59% of senior executives prefer to watch video instead of reading text, if both are available on the same page. – Forbes InsightAnalyse and Capitalise on existing user data. When we say ‘advances in web technology’ this doesn’t mean the latest web fashions. Development languages progress at an alarming rate and it’s important that SME websites progress with these rapid progressions. Evolving the design of your website is important – particularly if your message is that your business is innovative – but be wary of following quirky trends as in our experience they date quickly and can hinder customer usability. Advances in technology should improve website performance and customer experience. Due to the characteristics of SME’s (fast moving, adaptable, growth etc), businesses are ever evolving. Growth is the primary driver of change but it could also be the launch of new products/services, a rebrand, established values, new markets etc. A digital presence needs to be scalable and evolve in line with internal and external business changes. It needs to clearly define the business, its value proposition and culture. Customers will buy into expertise but they’ll also buy into a brand story and the personalities in the business. The only exception to this rule may be e-commerce stores where the customer is driven by price, delivery, product presentation, etc. Having a clear profile of your ideal client is imperative to understanding your own business and formulating a marketing strategy. The same approach should be taken when creating a website specification. By understanding your target audience you can tailor your website structure and content to appeal to them. The tone of voice that you use throughout your content – but in particular your primary headings – could mean the difference between a conversion or not. Your conversion strategy should also clearly guide your visitors to do what you want them to do. Google Analytics provides website managers with valuable data and insight as to how customers are using their website. Once your website has been live for 6-12 months (or longer) you will have collected enough data to analyse how visitors are using and engaging your website. You can then tailor your conversion strategy based on actual data and user behaviour. E.g. which pages are attracting the most website traffic? Are they set up to maximise the potential of that traffic?